Samuel Parker was born in 1681 in Chartam (Kent), second son of the pastor Samuel Parker (1640-1688). His father was chaplain of the Archbishop of Canterbury, from 1686 Bishop of Oxford, and president of Magdalen College in Oxford, a devout partisan of the Catholic James II (1685-1688). The young Samuel immatriculated in 1694 at Trinity College of Oxford. Faithfully to the paternal tradition, he did not take the oaths of allegiance required after the “glorious revolution” (1688), but retired in Oxford and dedicated himself to writing. A work of him is also preserved in our Library. He published philosophical essays, occasional writings and letters. He was a very erudite, but modest and pious personality, appreciated by his nonjuror theologian friends. In 1705 he was reported of wanting to found an academy in Oxford for propagating Jacobite ideas. Finally in May of 1711 he also took the oath, but in the meantime much had changed in the circles of nonjurors, and England was ruled by Anne Stuart (1702-1714), daughter of James II, sister-in-law of William III. Parker died in Oxford on July 14, 1730, either in hydropsy or in over-exertion. His younger son Robert founded the well known publisher of Oxford whose later owners include the architecture criticist John Henry Parker (1806-1884). The most important cultural act of Samuel Parker was the foundation of the monthly review Censura temporum, or the good or ill tendencies of books, sermons, pamphlets … of London, edited by him from January 1708 until March 1710. He discussed the views of William Whiston (1667-1752) and John Locke (1632-1704), for example in the question of resurrection. His own views will be later echoed by 19th-century Tractarians. Some of his works are: Bibliotheca Biblica, being a commentary upon all the books of the Old and New Testament. Gather'd out of the … writings of fathers and ecclesiastical historians … (the Pentateuch only). Oxford, 1720-35. 5 vol. – The history of the works of the learned. London, 1699-1712. – The ecclesiastical histories of Eusebius, Socrates, Sozomen and Theodorit. 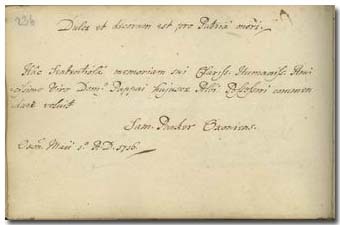 Faithfully translated and abridged … With a letter to Mr. Bolde concerning the resurrection of the same body. London, 1720. 3 vol.